The Illyrians were a population group that inhabited most of the southwestern Balkans along the Adriatic seacoast during the antiquity. In essence they inhabited all the northern area from mainland Hellas reaching as far as the Danube where they bordered and intermingled with the Celts. Eastward they bordered with the Thracians. Several Hellenic colonies were established along their seacoast so they also bordered these city-states and even intermingled in some cases and at various periods with their citizens. Their land is commonly referred to as “Illyria” but with the notion having little or no political meaning. Thus, it would be speculative to treat Illyria as referring to an ancient, inclusive, and coherent state organized and run by the Illyrians. Instead, the Illyrians were organized into different tribes and tribal association provided the main sense of identity and belonging. It is generally accepted that the Illyrians were first a Bronze Age population group, tribe, or community. Later, the term “Illyrian” was used by classical writers to refer to all the peoples that shared a similar culture and language and that inhabited the large region north of Hellas. Although they were labeled with a common name, the Illyrians were internally divided into many tribes. These tribes fought constantly against each other and against neighboring states, making this region relatively unstable. Intertribal wars were mainly caused by two reasons: to ensure the control over scarce resources in a region with limited agricultural resources and to maintain the authority of the tribal leader over his/her subjects and expand it. Thus, it should be noted that when an “Illyrian kingdom” or “Illyrian king” is mentioned in literary sources, it does not refer to the whole “Illyria” as a region but only to a part of this region where numerous Illyrian tribes had been joined by force or will into one state. 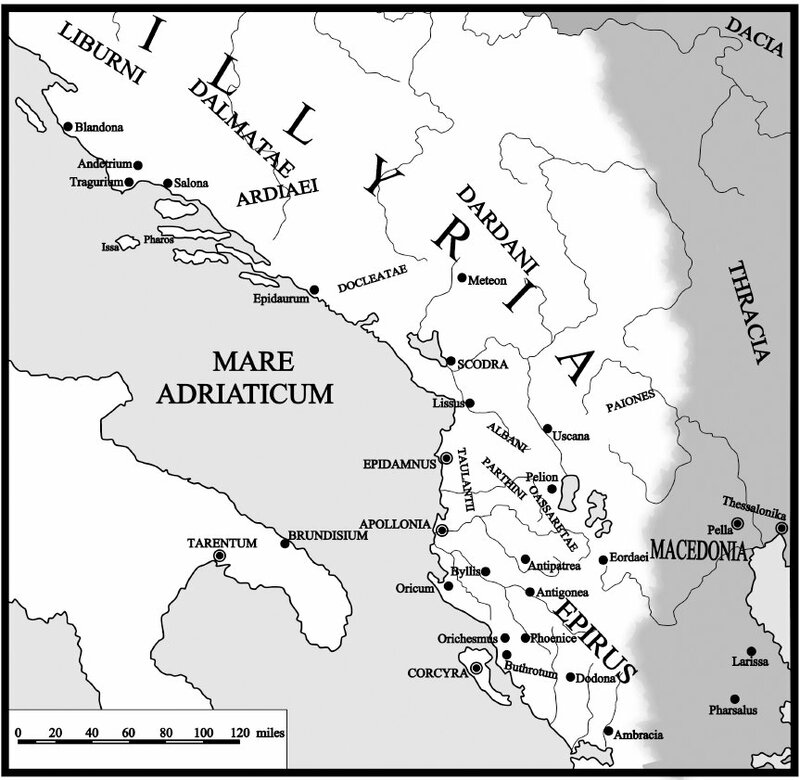 Among the many Illyrian tribes, the strongest were the Autariatae, the Ardiaei, and the Dardanians. On elf the first attested Illyrian king is Bardylis I (r. 393-353). Various scholars have linked Bardylis with various Illyrian tribes. For some time, it was assumed that he was a member of the Dardanians and thus the king (and even founder) of Dardania. Other have linked Bardylis with the Ardiaei in an attempt to establish him as a dynastic predecessor of the later kings of the Ardiaei. The generally accepted version is that Bardylis was a member of the Enchelei, an Illyrian tribe that occupied the area around Lake Lychnidus (Ohrid). However, it should be noted that Bardylis was able to create a state in which various Illyrian tribes were included in addition to the Enchelei, such as the Dassaretae, the Taulantii/Parthini, the Labeates, and potentially the Dardanians. Thus, he may be considered as the first Illyrian that ruled over a multi-tribal Illyrian state. Map of the Illyrian tribes and the neighbouring entities during antiquity. The first one of the above chapters describes the coastal lands in between the rivers Krka and Nestos (Cetina). This area represents what can be called as the northernmost part of coastal Illyria. Three Illyrian tribes (the Hierastamnai, the Boulinoi, and the Hylloi) are mentioned as situated in this area. The later were apparently only small Illyrian tribes with no significant impact on the power dynamics of the region. From these tribes, the name of the Hylloi is linked with Hyllos, the mythological son of Heracles. This name continued to be used even in Roman times to refer to the cape on the coast south of current Šibenik/Shibenik (Hylla peninsula). The later was connected with the cult of the Trojan hero Diomedes who apparently wondered in this shores after the fall of Troy. The text of the “Periplus” presented above mentions several Illyrian tribes notably the Nestoi/Nestaioi, the Manloi/Manioi, and the Autariatae/Autariatai. The later are of significant importance since according to Strabo they represented one of the strongest Illyrian tribes. Thus, an understanding of the descriptions of the “Periplus” and especially of the features mentioned in chapter XIV is necessary for putting the Autariatae into a right geographical context. According to “Periplus”, the lands of the Autariatae begin east of a “great lake” from which the Naron (Neretva) River flows away. Thus, the identification of this lake is crucial for determining the westernmost border of the Autariatae. Many proposals have been made presented as representing the lake of Pseudo-Skylax. The proposals include lake Scutari, lake Ohrid, and Mostarsko Blato. None of them seems satisfactory and does not fit the description of the ancient text. A recently revived thesis based on a proposal made by C. Patsch in 1906 seems more plausible. C.Patsch suggested that the “great lake” mentioned in the “Periplus” actually referred to the current marshy region of Hutovo Blato. In ancient time, the marshes of Hutovo Blato may have actually formed a significant water surface. Hutovo Blato is located 10 km east of Metković and 7 km southeast of Čapljina. Furthermore, in its northernmost corner a real lake is located, the one named Deransko (Deransko Jezero). The later divides Hutovo Blato into two parts. From Deransko, the Krupa River stems from. Krupa itself is a branch of the Neretva River (ancient Narona). Thus, the interpretation of the “Periplus” of Narona steming from the “great lake” is technically correct if this “great lake” is indeed identified whith Hutovo Blato. During the raining seasons, the whole region of Hutovo Blato turns into a large water surface that resembles a proper lake with a depth of 1-1,5 meters. Hutovo Blato covers a surface of 7,411 ha. The small peninsula of Ostrovo gives the impression of an island located within the lake, as described in the Periplus. Ostrovo, about 123 meters above the sea level, is located in between Deransko and Hutovo Blato. The surface of Ostrovo, although not small, is not as large as the island of the “Periplus”. Thus, it is not 20 km (120 stades). However, it is unclear if the 120 stades of the island refer to its size or longitude. C. Patsch suggests that the current villages of Teoc, Čeljevo, Zgoni, Višići, Skočim, and Trsana represent the island mentioned in the “Periplus”. One of the main Illyrian settlements mentioned in the “Periplus” is the “upper trading town” identified with ancient Narona. The city of Narona served as an important center of the Illyrian civilization. Its ruins are now found in Vid near Metkovic south of present day Croatia. The ancient city of Narona represented one of the most typical Illyrian cities. It had a pure Illyrian identity since it is one of the fewest places along the Adriatic where almost no ancient Greek inscription has been found. This is especially incredible considering that the city was already established by the IV century B.C.E. Although it is known that the city was founded and inhabited by the Illyrians, it is difficult to specify the name of the specific tribe in its territory. However, it has been suggested that the Illyrian tribe of the Daorsi ruled the city before the Illyrian Ardiaei subdued them. The old Illyrian fortresses in this area are concentrated on the hill near Vid as well as the hills of Marusica Gradina (375 m) and Velika Mitrusa (460 m).